I recently tackled the task of scanning all 2000+ pictures that my wife and I have from high school and college. As I was going through them all, I ran across a couple from my early college years that I thought would be fun to share with you. 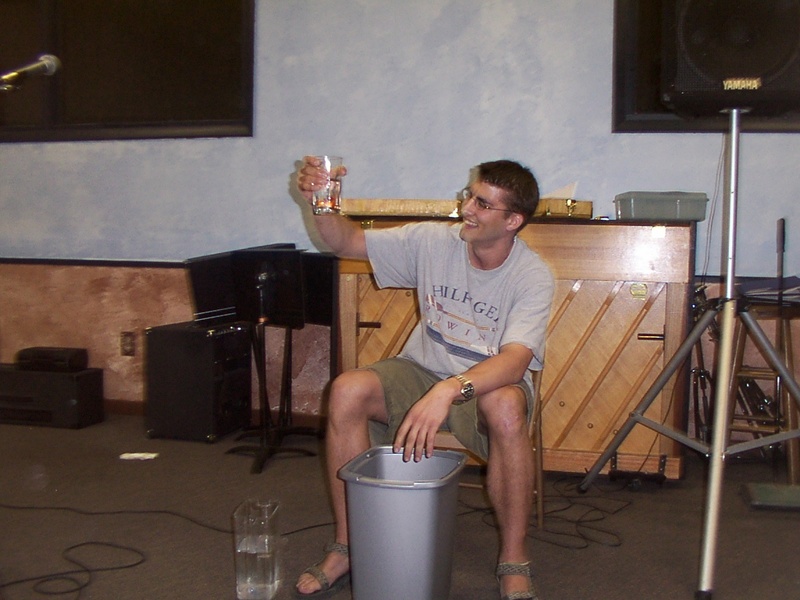 It was April of 2002 and CCF, the campus ministry that I was invovled in, was having an open mic night. Basically, it was a talent (or more realistically non-talent) show kind of thing. For the final act of the night a friend of mine, Chip Ewald, walked to the front of the room with a bucket and a glass of water with goldfish in it. He had a challenge. He was planning to see if he could swallow a goldfish and bring it back up again while it was still alive. Not only that, he wanted to know if anyone else wanted to join him. Everyone else in the room backed away from him so natually I hopped up and offered to do it with him. I’d swallowed goldfish before so getting him down was no trouble at all but the trick was bringing them back up again. Unfortunately Chip had chicken salad for dinner so the room cleared out pretty quickly when the chunks started to fly. I’m proud to say that we both managed to get one back up (mine was first of course). We named them Chuck and Ralph. I’m pretty sure Paul never mentioned vomiting goldfish in his lists of spiritual gifts but I think there is a chance a revised list might include that. As a student minister, I consider that a very valuable gift. It is right up there with the gift of Mt. Dew chugging and the ability to grow a great gotee (a gift that I’ve yet to exercise – hit the link for another great article from Stuff Christians Like). I remember that night … TOO WELL. It was gross. And I also remember that neither goldfish survived more than a few hours and they showed signs from their journey. Poor fish! I can just imagine you’re swimming around your tank at Wal-mart, then the trauma of being scooped out and being put into a bag is probably bad enough. But worse, to be eaten and afflicted to the pain of the human stomach … its like a fish horror movie! Shame on you Chris! The only flaw in your argument is that a couple of minutes after the goldfish is dropped into the bag (or into my stomach) it forgets where it is and what it’s name is. If you’re that worried about the little guys I think you’ve been watching too much Finding Nemo. No, the real flaw in my argument is that fish don’t feel pain. Still, it doesn’t seem like the best way to treat God’s creation. And really, I don’t know how entertaining it was … more gross and weird. But that just goes along with CCF’s open mic night.